Shannon Gray can be found passing the time doing what many would consider rolling, climbing, releasing, gliding and exploring. She enjoys things which consist of water, mud, trapeze bars, sand, and beautiful sounds. Shannon believes in the languages of creativity and soul is swept away by all things that entail the journey to cultivate these languages. She gathers inspiration through improvisation, staring at her crystal collection while listening to Hamlet Gonashvili, dreaming of and surfing perfect waves, dancing to the music of those who create from the depth of their soul, teaching through asking questions and performing by surrendering the need to find answers. Shannon has spent many years developing her love of movement and curating her unique and expressive style. She draws specifically from somatic studies, dance, yoga, the practice of Authentic Movement and her MA in east-west psychology. Specializing in dance trapeze, she emphasizes a rich connection between the ground, apparatus, and air, dancing in ways which unfold a story more then tricks. Born in Montreal, she has traveled extensively- collaborating, performing and teaching. 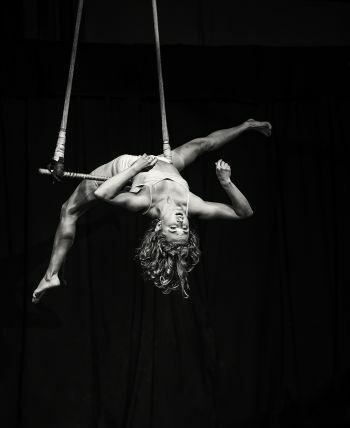 No matter the venue and event- dancing in harness off a high rise building, improvising with live musicians in a secret, underground loft, or suspended over the ocean on a 100 ft. zipline- Shannon brings a rare kind of honesty and emotional intensity to all of her work. She currently lives north of San Francisco where she is commencing her new work, The Sentience Project.